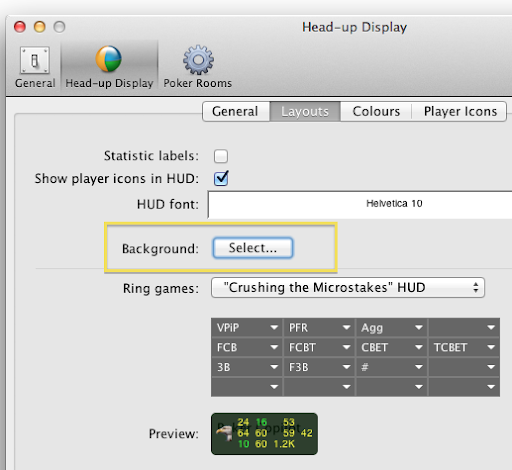 Poker Copilot 4 will allow you to the change the HUD background to any colour, and to any transparency level, from solid to completely see-through. 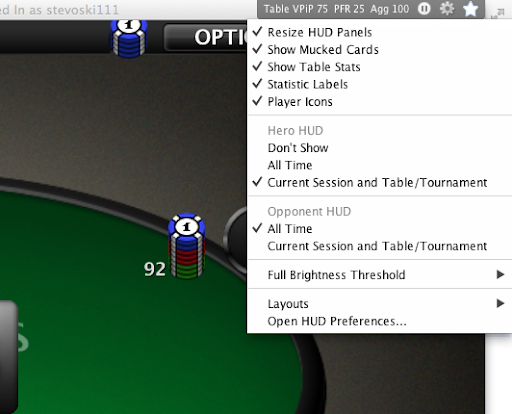 Poker Copilot 4 will have a drop-down menu available directly within the HUD to set the most common HUD preferences. This makes it much to a) see the results of changing the preferences and b) changing the HUD midway through a playing session. The folks at PokerSoftware.com have posted an up-to-date review of Poker Copilot. There is also a detailed video review of Poker Copilot. The next major release of Poker Copilot will be Poker Copilot 4. It is currently under development, and is going by the codename “PCP Dallas”. It is due for release mid-2013. Buy Poker Copilot now and you’ll get a free upgrade to Poker Copilot 4, even if the price goes up. Anyone who purchased Poker Copilot 3 from September 3rd, 2012 onwards will also receive a free upgrade. If you bought Poker Copilot 1, 2, or 3 before September 3rd, 2012, there will be a small upgrade fee. You can follow the development of Poker Copilot Dallas via our Early Access Program. At this stage all you’ll notice is PCP Dallas is exactly like Poker Copilot 3, except a little worse. I’ve spent the last couple of weeks working on some major internal work to conform with upcoming OS X changes. Apple has recommend that programs like Poker Copilot now include their own copy of Java, which while solving some support and maintenance issues, as well as ensuring that Poker Copilot will continue working, have blown out the size of the download from 20 MB to 80MB. I do hope to reduce that significantly before final release. Poker Copilot 3.22 is now available to download. There are several more such stories linked in the newsletter.